When you feel weak, stating core values can be a quick and easy self-control booster. People are rightly obsessed with self-control because they intuitively understand what studies have proven: that it is associated with all sorts of positive outcomes in life, like satisfying relationships and academic achievement. Failures of self-control, however, have been linked with addiction, overeating, interpersonal conflict and underachievement. Self-control can be hard to maintain, as most of us know to our cost. One study has found that exercising self-control is such hard work, it measurably depletes our glucose levels (Gailliot et al., 2007). The same study also found that having a glass of lemonade afterwards can restore us to full power. But not everyone appreciates the calories gained from a sugary drink or wants to wait while it is digested, so what other, quicker methods are there? Research on self-affirmation—thinking about your positive traits—has revealed that it can protect us from all sorts of automatic defensive responses. Schmeichel and Vohs (2009) wondered if self-affirmation could work the same wonders in the realms of self-control. Because often what exercising self-control means is avoiding our automatic response. To find out participants were asked to carry out a task that required self-control: they had to write a story but without using the letters ‘a’ and ‘n’. Participants then wrote about their core values, e.g. their relationship with their family, their creativity or their aesthetic preferences, whatever they felt was important to them. Finally they were given a classic test of self-control: submerging their hand in a bucket of icy cold water, which, if you’ve ever tried it, you’ll know becomes very painful after a minute or two. This group was compared with another that was allowed to use all the letters of the alphabet when writing their story, so didn’t have to exercise their self-control to the same degree (in total there were 59 people in 4 experimental conditions). Participants who could use any letters managed to hold their hands underwater for almost 80 seconds, on average. However those who had written the stories without the ‘a’s and ‘n’s only managed 27 seconds. This shows just how dramatically our self-control can be depleted. No wonder people find it so difficult to avoid temptation. However in the group that had to write the tricky story, then self-affirmed their core values, self-control did recover. They managed to hold their hands underwater for an average of 61 seconds. So it seems that self-affirmation can refuel depleted self-control. Note that self-affirmation didn’t improve self-control for people who completed the easy-peasy story. 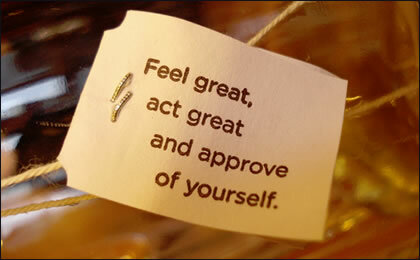 In other words the self-affirmation trick only works if you’ve already taken a hit to your self-control. In two more experiments the researchers asked why self-affirmation seems to have this beneficial effect on depleted self-control. Once again it came down to the idea that thinking about core values puts our minds into an abstract, high-level mode. This has been found to increase self-control (also: how to unconsciously increase self-control). So, the next time you feel your self-control ebbing away at work, with your personal projects or with your partner, think about what you most pride yourself on; think about those things you hold dear, whatever they may be. If this experiment is correct, then self-affirmation could help you discover new reserves of self-control.